Tinning pastes and solder creams are homogenous blends of metallic powders, fluxes and binding agents. This “all-in-one” concept saves time and allows for the precise measurement of the quantity of solder to apply. They are used in areas such as silverware, watches, eyewear, semi-conductors, aeronautics, rail, the automotive industry, various electrical and mechanical assemblies, and the building industry. These products complement the METACONCEPT Group’s range of preforms and solid or cored wires. Metallic powders are generally designed for the manufacture of solder pastes or creams. In addition to choosing a high quality powder suited to the intended application, an appropriate composition of the alloy must be selected in accordance with the intended brazing process.Have you defined the type of application? Contact us. Our technical staff will be happy to assist you in choosing the most suitable pastes or creams. 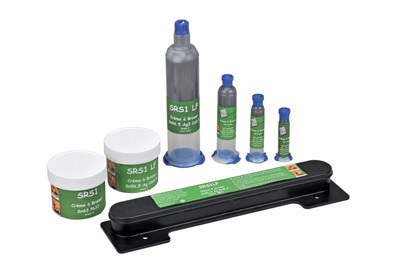 Solder creams are designed for the more accurate assembly of parts that do not require such active fluxing. Indeed, the choice of powder, its granulometry and the quality of the stripper means that the cream has a very precise action. This product’s syringe or cartridge packaging facilitates its precise application and optimises the quality of the joint. The creams are characterised by a flux dedicated to the intended application, unlike pastes which have a very active universal flux. Our range of creams includes 7 different fluxes each with a different type of activation. Cream storage: 12 months in a refrigerator at 10°C +/- 5°C. Metallic powders are generally designed for the manufacture of solder pastes or creams. Powders with a particle size greater than or equal to 75 microns are used for the production of tinning or solder pastes. Powders with a particle size of less than 75 microns are used for the production of solder creams. This table shows the most commonly used alloys in the area of soft soldering: Make sure that you store the powder in a cool and dry place. A prolonged stay in a wet environment could lead to “caking”. (*) Lead-free alloys – European standard no. 2000 / 53 / CE These tables show the most commonly used alloys in the area of soft soldering: For other alloys, contact us. 100% tinning paste has been specially designed for cooking- and food-related tinning. As the flux is zinc chloride based and contains additives that are flammable when the soldering temperature is too high, it is necessary to take all usage precautions when heating with the torch. The creams can be used in all industrial and electronics sectors requiring simple and safe, precise and high performance soft soldering. Formulations incorporating zinc chloride fluxes, lead-free and cadmium-free powders, meeting occupational safety and environmental regulations. The product safety information sheet below is available upon request from the METACONCEPT Group. Tinning pastes are designed to be applied via dipping, baths, with brushes or using syringes fitted with large diameter needles. Then, heat it in the furnace or with a torch to melt the alloy. Thanks to the simultaneous action of the heat and the flux the paint distributes evenly resulting in a watertight assembly with satisfactory mechanical strength. As regards solder creams, they can be applied manually or mechanically either with a syringe or distributed using a screen printing screen. The “refusion” is achieved using a flame, a furnace, via induction or electrical resistance. To prevent burns caused by the molten metal, it is advisable to wear a protective apron, shoes, gloves, helmet and glasses. – Do not smoke at the workstation. – The workstation must be well ventilated. – Wash your hands when leaving the workstation.